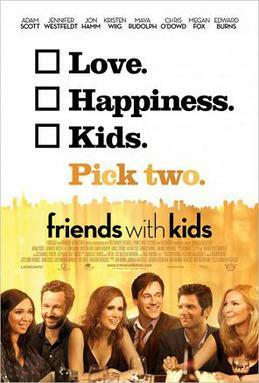 With this in mind, Jennifer Westfeldt’s directorial debut, Friends with Kids, is undoubtedly a timely film. It stars Westfeldt as Julie, a Manhattan-based investment guru, who, as she inches closer to forty, watches with a combination of dismay and envy as her closest friends begin to have children. The exception to this trend is Jason (Adam Scott), her longtime best friend. Jason is, ostensibly, a kind of iconoclast. An advertising executive, who is equally nimble with words and women, he has no pretensions of settling down. Life, he says, is about the unencumbered pursuit of pleasure, and, in a trope that turns up a few times throughout the movie, he spouts off against any religious suggestions to the contrary (notably, he keeps a copy of Richard Dawkins’ The God Delusion on his bedside table). And yet, like Julie, he admits that having a kid might be fun, particularly if it could be done without the trappings of marriage. So, after an amusingly awkward liaison, Julie and Jason have a child together, even as they are intent to continue to enjoy the financial and sexual independence to which they have grown accustomed. In fact, as they agree, that is the best security for a successful parenting experience, since it is only when such freedom is lost that having a child becomes an onerous chore. Friends with Kids is a romantic comedy, and so one needn’t be a rocket scientist to guess where it goes from here. The kid proves to be a blessing, and, as time passes, Julie realizes that she and Jason do not simply have an arrangement. Rather, they are a family. Jason is slower to warm to the idea, but, eventually, he comes around too, declaring (to put it discreetly) that sexual gratification can arrive because of marriage, not despite it. In a sense, then, Westfeldt’s film affirms (or anticipates) the opinions of Senior and Douthat: the juxtaposition of personal happiness and familial responsibility is a false either-or, albeit one that is increasingly tenacious in our society. On the other hand, like so many rom-coms, Friends with Kids articulates its position from within an individualistic, sentimentalistic worldview. In other words, Jason’s “conversion” does not involve a recognition of the importance of marriage as an objective commitment, much less an openness to Christianity’s understanding and promotion of the institution. Consequently, it is fair to wonder what will happen when his relationship with Julie hits a snag, when its newfound sexual intensity simmers down or, at least, rises and falls. Will he just go by his feelings? Or will he consult with some authority? Perhaps he will turn to Richard Dawkins, who will suggest that, far from a binding commitment, marriage is a “meme” that is culturally determined and, therefore, evanescent in the manner of all flesh. Whatever the case, Westfeldt is happy to ignore such questions, even though, in doing so, she fails to fully address the phenomenon that Senior and Douthat are concerned with. In short, Friends with Kids recognizes the problem, but is loath to think through the answer. I’m not sure this film set out to answer any questions. It was predictable and gave the audience what it knew it was going to get but it wasn’t a particularly “deep” movie. Many thanks for your comment. And, of course, you’re right: the film is predictable and ultimately not very “deep.” Still, the point of my response was just that — namely, that Friends with Kids raises a number of important questions, only to resolve them in a superficial way. Ironically enough, a blogger for The Guardian came to the same conclusion, albeit from a different perspective.